The Women's Domestic Needlework Group (WDNG) was initiated by artists Marie McMahon and Frances (Budden) Phoenix with the aim of reclaiming the creative, but historically undervalued, practices of embroidery, knitting, crochet, lacemaking and needlework. 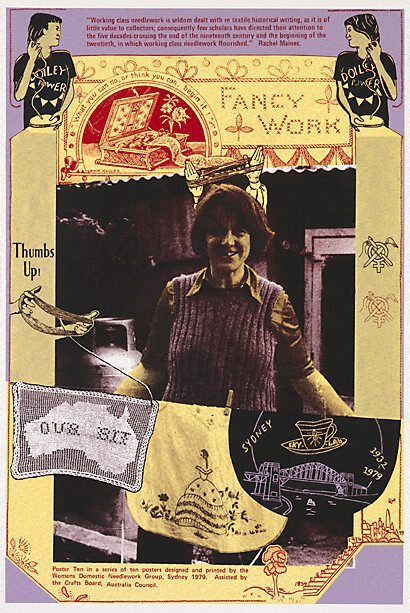 Having amassed over 700 crocheted d'oyleys salvaged largely from thrift shops, the artists researched and documented the D'oyley Archive and in 1979 mounted 'The d'oyley show: an exhibition of women's domestic fancywork' at Watters Gallery in Sydney. Ten screenprinted posters completed by WDNG members and the Earthworks Poster Collective (1972–80) at Sydney University's Tin Sheds Art Workshop acted as both explanation and wall texts for the exhibition. Regrettably, the D'oyley Archive was destroyed in a warehouse fire in 1985.